Born in Coachella Valley (California), Jenna Ortega is a young and talented actress who plays Harley, a creative and engineering whiz kid who is navigating life as the middle child in a family of seven children, in the the Disney Channel series Stuck in the Middle. 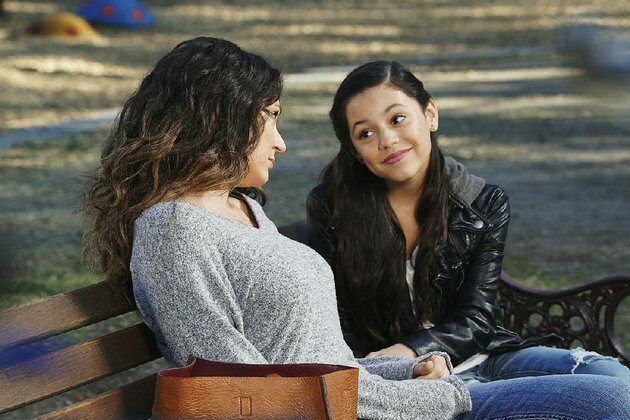 Besides, Jenna also plays young the younger version of Jane (Gina Rodriguez) in CW’s hit show Jane The Virgin and gives voice to Princess Isabel in Disney’s Elena Of Avalor series. In a new exclusive interview for our site, we’ve been talking with Jenna about TV and some other issues like her social media channels and her work as an ambassador for UNAIDS. – Hi Jenna. First of all, tells us about Stuck In The Middle. Stuck In The Middle is about a girl named Harley who is stuck in the middle of a family with seven kids. In every episode, Harley is hit with a new situation that she has to find a solution to while dealing with her big, crazy family. It’s a good show for families and teaches valuable lessons while making people laugh! – Right now we’ve seen three and a half seasons of the show. What would you highlight of what’s happened so far? Do you have anything to give us about what’s coming next? A highlight is definitely our Christmas 2-part episode! They were our first episodes for Season two, so much fun to film, and had a really sweet story line. The audience even got to meet abuela! Also, the Season three finale is MAJOR, especially for Harley! I cannot wait for you guys to see how cute that episode is. – Tell us more about your character Harley and her evolution during this time. Harley started off as a girl who wasn’t always confident and felt unnoticed by her family. As she’s grown, so has her confidence and her appreciation for her family. She is the engine of the family and will do whatever it takes to make everyone happy. – Any news about a potential fourth season? Season three is airing now, don’t know if we’re picked up for another season yet. Jenna Ortega as Diaz (Stuck In The Middle). – Besides Stuck In The Middle, you also have a role in CW’s hit show Jane The Virgin were you play the younger version of Jane (Gina Rodriguez). Tell us about that experience. Working on Jane the Virgin is so amazing! The cast and crew there are so incredibly nice and welcoming every time I go on set. Everyone is so talented, just being in their presence is an honor. – Do you work with Gina or do any kind of preparation with her for the character? I actually don’t. Gina is very busy and we don’t see each other on set very often because there can’t be two Janes in one scene! I think I know the character pretty well because I’ve been portraying her for four years now, and watching Gina act helps as well. – Acting aside, you’re also very active on social media. We’ve been told you just hit 3.3M Instagram followers! How did you start with it? What can you tells us about interacting with your fans and it’s importance? I started on social media because I just wanted to be like everyone else at school, haha. All my friends were talking about Instagram and I wasn’t allowed to make an account until I was 12 I think. Then my fanbase started growing and I started branching out onto other social media apps. Interacting with my fans is very important to me because I wouldn’t be where I am because of them! It’s so crazy to think that people all over the world know my name, and I am so grateful for that, so I try to show them some love. I try my best to spread positivity. I like to tell my fans how highly I think of them so that they’ll think that highly of themselves. – Tell us more about your work on organizations like UNAIDS. – Before we end, are you working on any other projects right now? That is confidential! A little bit of secrecy is always good. I do have a new movie coming out later this year though!